About 60 Iranian MPs are staging a sit-in in parliament to protest over hundreds of reformist candidates being barred from next month's elections. The MPs vowed to continue until the decisions, made by the conservative Guardian Council, were reversed. President Mohammad Khatami said he did not think the Council's methods were democratic and said he would hold talks with its members to resolve the issue. Up to half of the candidates registered have reportedly been disqualified. 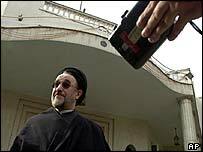 They include Mr Khatami's brother, who is head of the country's largest reform party, the IIPF. The 12-member Guardian Council, made up of six clerics and six Islamic lawyers, is empowered to ensure parliament's actions comply with Islamic principles. But the decision has provoked outrage among reformers. MPs threatened to go further in their protest. "We will continue our sit-in for as long as the decision is not reversed," said MP Ali Shakourirad, one of the barred candidates. "If the decision is not reversed we will take further steps in our protest action." Other senior figures expressed support for the protest. "The situation is like a football match in which the referee sends off one team and invites the other side to score," Vice-President Mohammad Ali Abtahi said. And in an open letter to Mr Khatami, the country's 27 regional governors threatened to resign en masse. Meanwhile the Interior Ministry said the disqualifications were "illegal" and could not be enforced. Prominent Iranian reformist MP Mohsen Mirdamadi accused Tehran's hardliners of staging a "coup d'etat" by "non-military means". "If this decision is upheld, there will not be elections but designations," he said. Two other senior members of the Islamic Iran Participation Front, Behzad Nabavi and Fatemeh Haqiqatjou, and well-known womens' rights activist Elaheh Koulaiee, have also been told they cannot stand. The BBC's Jim Muir in Tehran says Mr Khatami is under pressure to resign if his appeals to the council fail. Iran's parliament - the Majlis - is dominated by the reformists who have won all major national elections since 1997. But it is the Guardian Council, a highly conservative body, that has the power to decide who can and cannot stand for public office - a power parliament has tried and failed to end. The Council is under pressure from right-wing quarters not to back down and allow another reformist-dominated parliament to emerge, our correspondent says. Council spokesman Mohammad Jahromi said 2,033 of the 8,200 candidates had been barred, but MPs said the figure was higher. MP Reza Yousefian said more than 80 of 290 MPs had been banned from re-election. The Speaker of parliament, Mehdi Karroubi, whose application has been approved, expressed regret at the disqualifications. He said he and President Khatami had been engaged in many contacts with the country's Supreme Leader, Ayatollah Ali Khamenei, with the Council of Guardians itself and other leaders to try to avert a crisis. President Khatami said earlier that, if there were a large number of questionable disqualifications, he would use his constitutional powers to try to redress the situation. But those who have been turned down still have the right to appeal to the Guardian Council itself, so the final list of candidates will not actually be known until early February. "The coming weeks are about to see a lot of political wrangling behind the scenes"
How strong is Iran's opposition? Iran - Who holds the power?